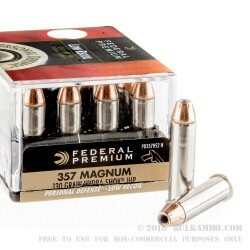 Worth every penny of the premium price point, this .357 Magnum ammunition in the Federal Premium line is a standard bearer for those who depend on the .357 Mag with engineered projectiles for their concealed carry firearms daily. 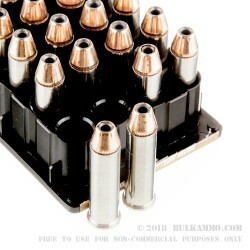 The performance and history of this round are matched in credibility by their producer’s track record for reliability and the quality level of the components used in the manufacture of the load. 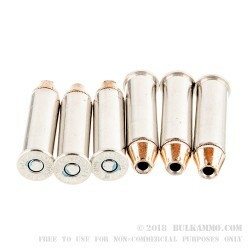 Made with a Hydra-Shok bullet in a 130 grain configuration with a jacketed hollow point design that has been proven for years in the duty and defense market, this cartridge employs top tier components. 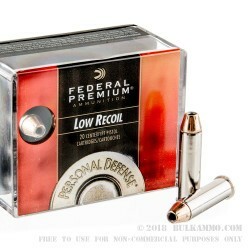 The cartridge casing is a nickel plated brass and offers a high quality, reduced recoil powder that also has a low flash for quicker low light follow up by the shooter. It is ignited by a Boxer primer of exceptional quality and which contributes to the casing’s ability to easily be reloaded by those who would desire to do so. The round achieves 1300 feet per second velocity and a potent 490 ft. lbs. of energy, despite being a low recoil round and offering such defensive perks as it does.